Whitey Schmidt shows off leeks from his garden. 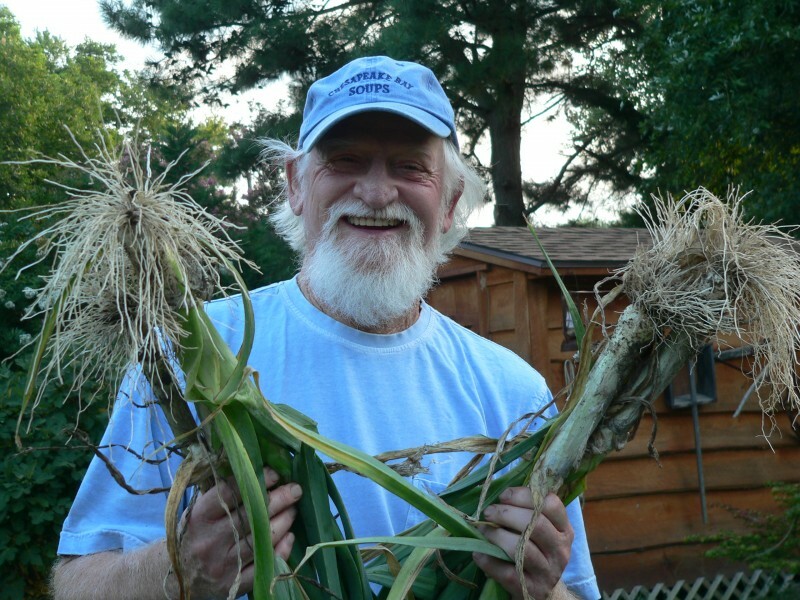 The Blue Crab Guru has left us, and the Eastern Shore has lost a great writer, a well-known foodie and a good friend. Whitey Schmidt passed away on Friday, July 18th. He had been suffering from chronic illnesses related to his diabetes from many years. I interviewed Whitey for several articles I wrote. When I heard the news of his death, I pulled out the interview recordings and listened to the sound of his voice. There were so many good quotes. Whitey grew up in Prince Georges County just a mile from Washington DC’s southwest border. But he was always attracted to the Chesapeake Bay and its bounty – particularly blue crabs. I recall Whitey saying he wouldn’t eat reheated crabs. He expected crabs to take at least 20 minutes to cook and if a restaurant brought them out less than 20 minutes after he placed the order, he’d leave. Over the years, the Chesapeake Bay blue crab was infused in Whitey’s Schmidt’s public persona. He lived in Crisfield, the self proclaimed “Crab Capital of the World” for the last sixteen years. The garage was clearly the fun part of the property. 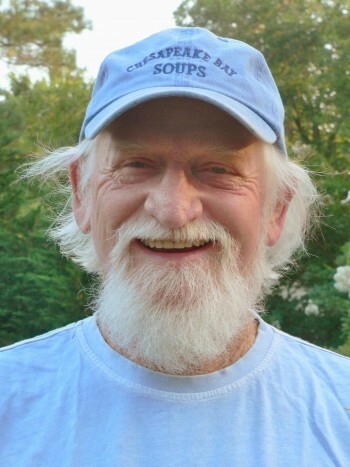 Whitey Schmidt became the Chesapeake region’s favored culinary authority on all things related to the blue crab when he published The Crab Cookbook, which was followed by the best seller, The Chesapeake Bay Crabbiest Cookbook. The guru’s smiling face, framed in silver-white hair has become familiar not only to Chesapeake area cooks, but to anyone who has thumbed through his cookbooks in bookstores, gourmet shops, specialty gift stores, and farmers markets that dot the cities and towns bordering the Chesapeake Bay. Whitey Schmidt confessed that he’d been cooking all his life, but in the last thirty years he traveled the entire Chesapeake Bay region and managed to eat in 274 crab houses. He collected a menu cover from each one. He estimated he’s eaten more that 3000 crabs and consumed “a whole lot of beer.” Since his days as a crab house circuit rider, Whitey emerged as a regional authority on the best seafood restaurants, and he collected hundreds of recipes along the way. Whitey launched his writing career when he received four phone calls in one day from friends asking for his recommendations on the best places to eat steamed crabs. He figured he might as well write a book and tell the interested public all about blue crabs. He wrote several books on crabs and expanded into soups, oysters, and produce. At the time of his death, he was the author of eleven cookbooks, and he owned his own publishing company, Marian Hartnett Press (named after his mother). If Whitey was good at cooking and good at writing, he was even better at marketing. Whitey was a marketing genius. He ran his entire cooking, writing and publishing operation from his garage in Crisfield. “Recipes are everywhere” was the common response Whitey gave when asked how he finds recipes for his cookbooks. “I could be standing in a grocery store line, or at the post office or talking to a friend. I always ask the same thing … ‘What are you cooking tonight?’ and from there the conversation progresses … ideas come up for some new recipe to try” Whitey admitted that he gathered recipes from conversations, magazines, newspapers, and restaurant chefs. Once he noted or collected a recipe, he tossed it into a labeled beer carton. This was Whitey’s method for sorting content. The bookshelves in his home office had seventeen labeled beer cartons occupying three shelves when I visited him a few years back. He also shot over 5000 photographs of Eastern Shore roadside produce stands, farmers markets, food festivals and food art, scores of which are featured in the book. The photos and text in The Eastern Shore Cookbook chart local food traditions and heritage. They capture the Eastern Shore essence that defines the culture of the region. Whitey’s strategy for collecting, revising and testing recipes, and his talent for book publishing brought him considerable acclaim. His books have sold in the thousands. He has twice been featured on Maryland Public Television including the show Eating Crabs Chesapeake Style which garnered MPT an Emmy award. Perhaps Whitey’s greatest contribution wasn’t the great recipes and reviews of the best places to eat … or the tutorials on how to cook or how to eat a crab. Perhaps Whitey’s greatest gift to us was his recounting the food history of one of the most unchanged regions along the Chesapeake – the region least impacted by development or infusion of immigrants, a region that still clings to its heritage – the greatest part of that heritage being the bounty of the bay and the land. He unfolded the food stories of the Eastern Shore by chronicling Chesapeake traditions and recipes. Then he delivered them to the hungry public “Whitey style” in the simple format of a cookbook. But Whitey’s biggest contribution to Dan and me was friendship. Whitey was even a better friend than he was a cook. He was so much fun. That smile of his could light up a room and I can still hear his hearty laugh. And he made amazing whiskey sours.